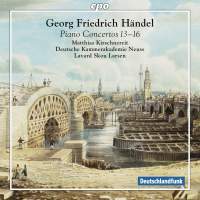 All right, so George Frédéric Handel did not write any piano concertos, and all of the works on this disc were originally for organ, but pianist Matthias Kirschnereit takes great pains in his notes to “explain” why he has chosen to perform them, with a rather sizeable ensemble as the Neuss Chamber Orchestra, as such. He claims that Handel himself was quite flexible when it came to which instrument he wished his concertos to be performed with, noting that the op. 4/6 concerto was originally published as for “organ or harp.” Personally, I am not convinced by this or the further argument that “articulation” and the “opening up of a larger, more virtuosic operational space” provides the raison d’être for such a disc. And yet, one must note that the composer himself had constructed a strange beast in 1738, a two-manual claviorganum (combination of harpsichord and organ) called by Charles Jennens his “maggot.” So, he was not opposed to creative solutions or novel ideas when it came to the performance of his organ concertos, the first of which was published this same year. Thus, the question remains: How do these now well-known and oft-recorded works sound on the modern Steinway? Well, they are playable, but there is something a bit awkward about the combination. This is quite apparent in the longest and most complex of the works, the F-Major Concerto (HWV 305a), which is a huge suite with extensive horn parts and additional oboes. In the first Allegro the blend seems a bit off kilter, and the cadenza that ends it seems almost Mozartean rather than Handelian. I do like the following Adagio, where the solo instrument seems almost to float with a rather nice resonance. The subsequent contrasts between the horns and oboes and the piano in the following movements revert to the not-quite-there timbral confluence that the organ would bring. This is, to me, a function of the hammered strings versus the wind pipes one finds on the latter, but that is not to say that it is displeasing. It is just different. As for the accompaniment, the chamber orchestra is rather full-bodied, with the microphone placement offering a powerful and in-your-face sound. This does complement the modern instrument, but it seems a ways away from Handel. So, here is your choice. This is not simply a modern rendition, but rather a modernized version all around, and as such makes a decided contrast with early instrument performances. I find the sound a bit overpowering (though realizing that it must needs be if it is to compete with the Steinway), and although the orchestra and soloist acquit themselves well, the textures are often a bit wooly. If one is wondering how Handel’s concertos might sound on a modern instrument, then this disc might serve as an example. I, for one, still prefer the original conception that Handel envisioned and thus am not impressed by this recording.